As I've mentioned, moods are flexible. It is easy to switch moods when you see nice fish...steadily...surface feeding. Then being a purist is so easily done. Well that's what's happening on the LT right now (depending on cloud cover)...a couple of classic, over-cast days of Autumn, producing 2-3 hours of an intense, mid-day, BWO emergence...then the sun comes out and the bugs slow down (see October 30). A 2-4:30 PM resulted in a 3/2 session. The entire time I had targets. First one uncorked and then netted 15" and 17" RB's. All three aggressively, jumped-on (they weren't dainty takes!) a #16, No-Hackle, CDC Post, BWO Emerger...trailing a #16 Olive ComParaDun. Fished 1:30-4:30 PM for a 6/2 session. Connected with "Pablo"; he having just landed a 17"-18" RB upon my arrival at Brian's Bluff...he then proceeded to hook 5 and net 4 more in the upper-water column with his own BWO emerger tye. My two to the the net were sub-surface; 16" & 17" on a #14 rose-colored egg and one of my favorites...a #20 Black Midge Pupa. 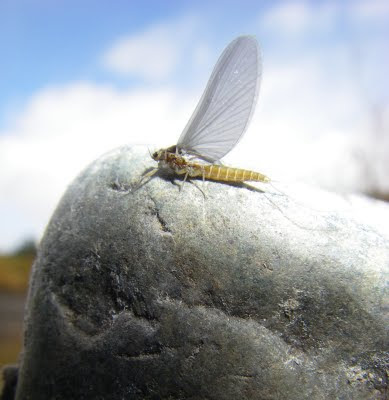 Nice, classic overcast day; BWO emergence & corresponding rise activity the entire time. Surprisingly there were over 40 intrepid fly anglers who attended the California premier of the 16 mm film RISE at the Judah Lodge at Sugar Bowl ski resort on Saturday, Octobetrr 24th. The proceeds went to two local groups; Tahoe-Truckee Fly Fishers and the new TU Truckee chapter. It was sponsored by Sierra Fisherman magazine and Cloudveil. Hey...the movie was truly well done cinemathographically (...such a word?). It entailed interviews of people who ply their trade in both salt & freshwater enviorns with accompanying fly fishing scenes. Labels: ...or "Once in a Blue Moon"? Yeah...moods can be fickle & short-lived. Depending how locked-in you're in your tactical mood...in this case "head-hunting"; your mind-set is always subject to change. If there aren't consistent and rhythmic surface-feeders...forgetaboutit! Go down. Call it being a pragmatist. I don't get to fish much myself because I'm mostly with clients. Essentially, I'm fishing through them so I strive to get them into fish...when it happens that is my gratification. Autumn is my first sustained time when I can do it for me! This is what has occurred during this "mood" change...the two browns below were TAPED, no BS or quessimates!! I'll be honest, I thought they were larger while the struggles ensued; the taping set things straight. 3/1; consistent and rhythmic risers resulted in 19-1/2" RB on #22 Brook's Up-Right, Organza-winged Spinner...two rising RB's lost on unanticipated SECOND moves on Brook's fly. I figured on the first moves and applied necessary pressure to move them away from the security lies. Then both made moves that I was not prepared for...very smart trout. 3/3...24" Brown on #12 pink egg, 11" Brn on #18 Olive Mico-May,11" RB on #20 Griffith's Gnat. 4/2; 11" RB on #20 Red Brassie, lost 2 RB's in the 15"-17"...on for about 30 seconds each, #18 Olive Hackle-Stacker and #10 Peppas Egg. The big buck on...a #20 Black Midge Pupa!...no s&^*!...my best-ever "20-20". In this case a 24" Brown on size 20 fly. I'd be lying if I said I wasn't pumped. Amazing, two "fish of the season" in three outings...how sweet it is! Fly anglers are of myriad personality types. Some of us can be viewed as loners, at-all-costs-crowd-avoiders, essentially anti-social. Some of us not, savoring interaction, "fish gossiping" and seeking-out communal-group angling; camaraderie is what it is about. Regardless of were you're button-holed within the above two extremes, we all display moods; in this case, specifically...fishing moods. These angling moods can be seasonal or change day to day. Each mood can fit into a different mind-set relative to strategic...as in seasonal...or tactical...relative to what is occurring at the moment. Yikes---Being so blog-techno-challenged I inadvertantly deleted five posts!...the intial ones I posted starting in August. I know that it said it can't be undone...but can it? ...Any help out there or advice ? Personally, I'm a firm believer in giving back to a resourse that has been good to you. In this case...your "home-water". If in fact you fly fish a specific area or water...Put your body or $$$ where your flies are. 1---Getting politically active in ensuring that your local fishery and its habitat is protected, preserved and enchanced. 3---Give $$$ to an organization that has your local fishery in mind. Minimally one, of the above indicates that you care about your fishery; doing all three...Great! If you do none of the above as an angler but take advantage of the special regs that have been put in place via the aforementioned three items...simply, you are a taker. In the case of those who make $$$ from the fishery...in my view...you are an exploiter...and a TAKER. I have no problem if you disagree with the above...as long as you're civil nad we can amiably agree to disagree. I just returned from a short (6 night/5 day), "exploratory" trip to Dillon Montana. The area has always intrigued me as I returned to California via I-15 past the Beaverhead and Clark Canyon reservoir; two bodies of water that I'd both read and heard about over the years. Two years earlier I fished the region's Ruby river and had great fly-fishing during pre-run-off April. The area is over-shadowed because of the more famous waters available nearby such as Montana's Madison, Yellowstone, Firehole and Galletin rivers, Idaho's Henry's Fork; plus the numerous "grapevine", hush-hush-toned venues in western Montana & north-west Wyoming. Suffice it to say that I will return to the area next fall. In addition to drifting the Big Hole and both wade-fish and float the Beaverhead, I will also explore Pointdexture Slough, a spring creek that flows into the Beaverhead about 3 miles out of town. This time I'll visit during the third week of September because we did experience some nasty weather for two days. At times the early snows and high winds made it difficult to fish...let alone cast. I can't say enough about the class-act of Tom & Mary Smith's Back Country Anglers; #1 guide Andy and Tom's mellow canine partner, Tippet. All were great hosts; at the lodge, the shop and while on the water. Their personal service and friendly "down-home" demeanor was appreciated by both my bro-in-law Jim Williams and myself. I highly recommend them if you visit the Dillon area. We floated the Big Hole river twice and the Beaverhead once. The best dry fly fishing occurred during snow flurries on the Beaverhead. 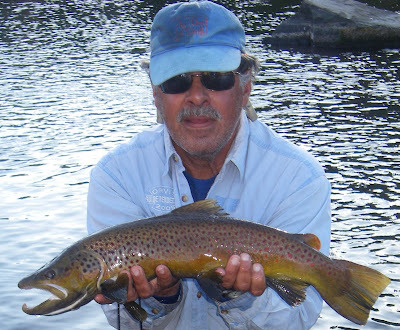 We cast to rising trout for over three hours and landed 10-12 rainbows & browns to 18". The trout were in pods, elevated in the upper water column and feeding voraciously and steadily on #22-24 emerging Psuedocleons. We even hooked a couple on our indicator-dry; a #14 Parachute Black Ant. The Big Hole had no rising fish so we indicator-fished using a San Juan Worms trailing either a #16 Copper John or #18 Micro-May. Most trout...and whitefish...were duped on the smaller patterns.